Advice from Marta | Because sometimes you need good advice, even if you don't want it. In our house March 2019 was a month of endings. I quit my job. My son quit hockey, deciding not to move up to the next level, and after nine years, my daughter quit Irish dancing. Oh, it was. Of course, this is what makes me sad, not the loss of the over-priced bread, not the loss of the hockey odor permeating my house, not the loss of spending most of February and March with a jig beating in my head. It is the loss of “the life.” The loss of yet another stage of childhood. The loss of days spent running in the park, watching trains and eating sweet, gooey bread. The loss of days spent watching my son skate, watching my daughter dance. We all know the stereotype. The stage mom, the sports dad, the parent desperate to relive their glory days, or their never-were days, through a child. They yell from the sidelines, forcing their child to practice, urging their child to keep going, ignoring their child’s wishes. They never let their child quit. None of us think we are them. But then they say they want to quit and for just a minute we try to talk them out of it and we wonder whose life we are living. Parents live two lives at once, our own and our children’s. Despite our wishes, despite our intentions, we measure our lives in strange ways: the game we almost won, the goal we finally scored, the step we practiced, when we got to wear the dress, when we got a team jacket, a wig. “What are you doing this weekend?” “Oh, we have a game.” “Do you want to …” “No, I can’t I have to take someone to a practice somewhere.” Before you know it, there you are a hockey mom, a dance mom, a baseball mom and then you’re not. Then you are what you’ve always been, a person looking for her own next thing, her next step, maybe even her next dream. As we move past each stage the time to figure it all out seems shorter. My daughter has made her next dream clear. She wants to be an actor. In the past month she has finished up one show, auditioned for three more, and started rehearsals for the one she was cast in. This dream has the potential to break both our hearts over and over again. But we’ll keep going. My son’s next step is unclear. Since he started t-ball in kindergarten he’s been on at least one team a year, every year and now suddenly, he is, like me, looking for something new. Maybe next week or next month one of us will find something new to do. Or maybe, we’ll just find a new place to sit and watch the trains. The next stage is coming and all we can do is wait and see what it brings. Today, driving through Chicago and past places I used to work and now barely recognize, I started thinking about the “When Wes.” The year I turned 16 I lived in Malawi. I went to an international boarding school. Most of the students were the sons and daughters of businessmen. A few, like me, were the children of professors. A few were the children of missionaries or diplomats. Most students were European, although there were some Africans, primarily Ugandans, South Africans, and a few Malawians. The teachers, all of whom were called “Miss” and “Sir,” were a mix of young British teachers looking for something interesting to do before having children of their own, older Europeans who were there for various reasons, and white Rhodesians who had left during the war and upheaval when Rhodesia became Zimbabwe. The former Rhodesians were not poor, but they were homeless. There was a lost look in their eyes and they spoke with a perpetual sigh. “Oh him?” I was told late one night in the dorm when I complained about a history teacher, “he’s the worst of the whenwes.” “The what?” I asked. “Rhodesians are called when wes,” my new friends explained, “because they start every sentence with ‘Well of course, WHEN WE were in Rhodeeeesia'” We laughed and smoked our smuggled cigarettes and I tried to mimic “When We Were in Rhodesia” in my American accent, which only made everyone laugh harder and eventually we went to bed, some in our own beds, some in each others. There were those in the dorm who would have cared where we all slept, who would have cared about the cigarettes, but the Head Girl was with us, and the sister of the Head Boy and everyone except me was a prefect, so no one said a word. We were young and beautiful, and at least in that country, wealthy. It made us merciless about all adults, but especially the when wes. One weekend night three of us went to a restaurant by ourselves. We had martinis and steak stuffed with prawns, and espresso and tiny cigars and no one batted an eye at the sight of three teenage girls eating like middle age men. We were just like adults, only better. We were not sad and we were fairly sure that we never would be. Many of the girls had already lived in multiple countries and gone to multiple schools and the idea of mourning anything as silly, and as easy to replace, as a home or a country made no sense to us. Later that year, the former boyfriend of one of us was killed in a motorcycle accident. A few months later the term was over and I went back to the States. Almost everything about that year, the parties, the sun, the weirdness of it all, faded into a dream. It was before Facebook, or even email, and I had no other ties to Malawi, so I lost touch with everyone. About a year ago I found a man named Smitty who lives in Malawi and puts out a monthly email newsletter. It has some current news of the school, but mainly it is full of memories and history and death notices. Most of it is meaningless to me. The school has been around since 1958 and I was there for one year in the 1980s. But I glance through it, hoping to find something that I recognize, hoping to find a little bit of the time I lost. Of course, it seems cruel now. Teenage girls emulating grown ups while mocking their loss. But we didn’t know. We did not know how easy it was to become a when we, no matter where you live. Last night I slept with the windows open and this morning around 7:30 I was woken up by a man yelling on the sidewalk. He eventually moved into the middle of the busy street next to where I live and began yelling at the cars. Then he moved on to a different side street and I started my day. A little later when I was walking the dog a girl across the street yelled out the window of her screened in porch, “It’s my birthday!” “Today?” I asked. “Yes, and I am five years old.” “Happy birthday,” I said. “Thank you,” she politely answered, still at top volume from across the street. A few seconds later she saw the ten year old from a few doors down who had come to pet my dog. “Audrey, it’s my birthday today,” she yelled. “Happy birthday,” Audrey said. I took the el downtown to meet out-of-town friends for lunch. Two young men were in the middle of an impassioned conversation that transitioned from bicycle culture to the future of Artificial Intelligence. An older man across the aisle began to get frustrated with them. “The thing is,” he said loudly, “The thing is that we’re going to get a new mayor and we need a new mayor and that’s what’s going to make a difference, not all this computer stuff. We need someone to do something around here, and you need to vote.” “I can’t vote,” said one of the men with a slight accent, “I’m not a citizen.” “Well, all I know,” the older man answered, “All I know is it can’t be that Bill Daley, we’ve had enough of that, we don’t need a third. Maybe Toni Preckwinkle, she might be ok, maybe vote for her.” “I can’t vote,” the man repeated, “I’m not a citizen.” The older man continued debating the various candidates. 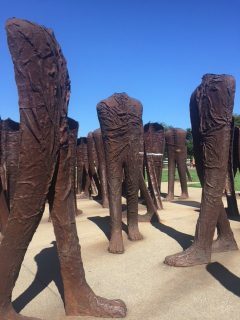 After lunch I walked through “Agora,” a public art installation of 106 headless, armless torsos standing and walking. The agora, the marketplace, the center of town, it’s one of the concepts I remember from high school humanities class. Sometimes we are in the agora by ourselves and sometimes we are with others. Sometimes we have something we want to say and others hear us. Sometimes, we are just yelling at cars on a Sunday morning. My husband’s family has a cabin deep in the woods of Northern Michigan. So deep in the woods that the first time he took me and turned from a dirt road into a random, unmarked clump of trees and up a hill I thought, “Well, here it is. Here’s how my life becomes a Lifetime Movie of the Week with an understated subtext of ‘this is what happens when you wait until you’re 30s to get married, that nice-seeming professor is actually a serial killer. '” I was hoping they would solve the case quickly enough that Martha Plimpton could play me. When we were teenagers I auditioned for a movie role that went to her (River Rat), and so I’ve always thought that she would be the perfect actor to play me in a movie. Next time you see Beautiful Girls or Goonies, you’ll see, we look alike. Not so much by the time she was in Parenthood, or today, but definitely when we were teenagers. Eventually, the cabin came into view, and I have never again wondered if my husband might actually be a serial killer, although I have had related thoughts about the cabin. There was the time I was husking corn on the front porch (because that’s one of the things you do in a cabin in the woods) and a man on a white horse came riding up to the steps. No one has ever found this cabin accidentally, frequently you can’t find it when you’re trying, but there he was, somewhere between the ages of 50-150, weathered, pony tail riding a white horse with no saddle. I went inside and eavesdropped while he told my husband about living off the grid and roadkill stew. I don’t sleep well at the cabin, not just because I’m overly concerned about serial killers, but also because the entire house is dusty and musty and while at first sleeping on sheets with cartoon versions of Laurel and Hardy was quirky and charming, now it’s just itchy and threadbare. I also think it’s possible that the 10 years worth of Isaac Asimov Sci Fi Magazines and equal number of Archie Comics may be giving off a toxic mold (although I hate to think that because really, the Archie Comics are one of the highlights of the place, especially now that my daughter and I watch Riverdale). But the other night, on our third night at the cabin I was sleeping. I was having a dream that took place in a train station bank and over an intercom came a metallic voice “FIVE” “FIVE” “FIVE.” I was trying to figure out if it was about money or a train when I realized that it was not in fact part of the dream, it was outside the cabin. Maybe. Hopefully. My husband also heard it and thought it was me breathing. He did not hear the voice saying five, he heard breathing, or maybe barking and I thought, “THIS is it. This is the moment when it all starts to unravel.” I could not NOT hear the noise, and I could not NOT hear it saying “FIVE in a sharply metallic voice.” I lay awake and tried to figure out which movie I was in. Was this Stranger Things, a government experiment deep in the woods? Had aliens landed? Nuclear war? Or was it a deep-think horror movie about the existential crisis of motherhood? Because for a few minutes I considered holding the pillow over my husband’s face until I could figure out if in fact it was him breathing. Once I did that, I would of course have to go into each of the kid’s rooms and do the same and then the audience would never know if I had been driven crazy by a combination of a lack of sleep and toxic Archie Comics mold, or if the cabin was haunted or if I was evil and the whole thing was a set up so I could run away with my much-younger lover. I think that maybe over the credits you would see a non-specific shadow that you could interpret according to how you feel about mothers today. I still hope Martha Plimpton plays me. The next morning neither kid reported hearing the sound and my husband still swore it was a dog, or maybe a coyote. The noise did not reappear the next day and so once again, I have narrowly avoided a grisly end in the woods of Michigan, and Martha Plimpton has once again missed out on a great role. I am on the el in the middle of the afternoon. At the end of the almost empty car, in the part that’s slightly separated, and so perfect for sleeping, is an older African-American man. He is standing up and yelling about something. He is not loud, but he is yelling in the way that crazy people yell on the El. Standing in the almost doorway of that part is a younger African-American man. He is in his 20s, dressed in khakis and a polo shirt. He is holding a baby and carrying a backpack. The baby is large, maybe as big as my kids were at 18 months, but he seems younger, maybe a year, maybe 10 months. The baby is propped a little on his leg, sleepy and unsmiling. The younger man is speaking calmly to the older, yelling man. It has been years since I stood, holding a too-heavy baby with no relief in site. But I can feel this baby’s heaviness in my arms. I try not to stare but I am desperate to decode the situation. I decide the younger man is trying to help the older man, to get him off the train and get him food or help. Then the younger man says, “We’re at Cicero,” and he starts to walk away and stops by me to ask me for a dollar. He starts to tell me he needs to get on the bus, or something, and I do not even listen to the rest of his story. I have no right, but I am disappointed. The life I imagined for this baby, with the strong father who stops to help strangers on the train, even while carrying his baby, is not the life this baby is having. This man is not the man I want him to be. I have no right to my anger and so I silently open my wallet and give him a dollar. I know better, I never open my purse, let alone my wallet, on a train, but I hand him the dollar and he walks out through the connecting door. He carries his baby from el car to el car through the connecting door and I am unjustly angry all over again. The older man comes out of the vestibule and sits exhaustedly on a regular seat. His black t-shirt has something written on it in gold and he is wearing pink clam diggers with a black leggings or knee braces barely visible. It is the outfit of a crazy person yelling on the el, but out here, quiet and tired, he no longer looks crazy. He looks like Iggy Pop. Photographed correctly, in the right clothing, he would look like an aging dancer. Photographed a different way, like a heroin addict. He lays his head back on the seat and closes his eyes. A few minutes later the younger man and the baby come back through the connecting doors. The younger man plops the baby down on the seat next to the older man. I finally understand that these two are not strangers. The older man lays a protective arm over the baby. A few minutes later, although the baby has not made a noise, the older man picks him up and moves him to his lap. The baby turns his body into the old man’s, placing his tired head on the man’s neck. For a minute, they look like the Pietá and I want so badly to stare, to take a picture, to try and figure out the new story developing. How are these three related? What is the life these men are living? How do they have anything left to cradle this child so tenderly? I take out my phone, wondering if I could secretly capture the image, and I get a text from my daughter. About a year ago she decided she wanted to be an actor. She is taking a summer musical workshop through her high school. This is only the third play she’s ever auditioned for. She did not expect a callback for a lead, but she hoped, of course she hoped. I hoped for her. She will say she is not sad. She does not like pity or sympathy. As I’m trying to decide whether “Too bad” or “Oh, I’m sorry” is the exact right response, the younger man stands up and takes the baby from the older man. The older man gets up, too. The baby is still sleepy, but not asleep. The younger man blows a raspberry on his cheek and the baby laughs. It is the first noise I’ve heard from him. It is almost too deep for a baby that age, but it is glorious. The trio leaves the train and I still do not know the story. I know that it is harder to be a 14-year-old girl who did not get the part than to be her mother. I know that it is harder to be the person asking for money than the person giving it. It is harder to carry your child from train car to train car than it is to sometimes wish you could still hold her. I know all of this. But sometimes I think it is plenty hard for us all. A few years ago a young man from South Africa stayed with us for a week. During the week he told me the story of how he came to be adopted by his mother and given his name. He was the product of an extra-marital affair and for the first few years he lived with his biological mother and an abusive step-father. 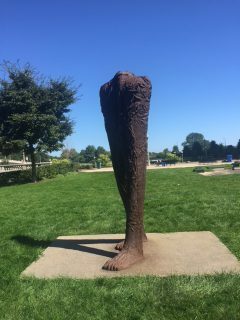 The abuse became bad enough that one of his legs was permanently damaged. His biological father came and took him and brought him to live with him, his wife, and their children. His wife, the woman on whom he had cheated, took in the child of his affair and renamed the child “Given,” because he was a gift to her. The other day a young teen told me that they were happy because every year on Mother’s Day their family takes a three generation picture, child, mother, and grandparents. This year is the first year since the teen came out as non-binary and it will be the first year that they do not have to wear a dress for the photo. The birth of my oldest child in late February was difficult and dangerous and left me with health issues that took almost a year to completely diagnose and solve. Mother’s Day was one of the first days that I felt strong enough to be up and out. We went out to lunch and to the outdoor mall. I remember the way waiters and shoppers congratulated me and cooed at my beautiful daughter. Everyone I saw smiled at me and wished me a Happy Mother’s Day. In some ways it felt like another birthday for my daughter and me. I felt loved and accepted, and seen, and I felt like I could in fact be a mother. I know that Mother’s Day is not easy for everyone. For those of who have lost mothers or children, or are estranged from them, or are having trouble conceiving, it is especially difficult. But even for those with intact families, it can be hard. My Facebook feed is full of memes that are kind of funny and kind of bitter about Mother’s Day. Mainly they’re from moms hoping that they won’t spend Mother’s Day fighting with their families, pretending to like gifts, feeling subservient to mothers-in-law, or cleaning up the messes created by breakfast in bed. As children we look to our mothers to tell us who we are, to tell us our place in the world, to make us feel loved and to make us feel that we are gifts. As teens, we look to our mothers to stop telling us who we are and start really seeing us as we are. Kids ask all the time why there’s Mother’s Day and Father’s Day and no Kid’s Day, and almost all parents answer “Because every day is Kid’s Day,” except it isn’t. Or maybe it is, after all, every day is a day we all go out into the world looking to be seen and loved. Some friends of mine bought a house. It was their childhood home. It was not their only childhood home and in reality, they probably did not live in it for that long, but it was the first and last home they all lived in together with both parents. It was a beautiful house that loomed large in their family mythology. I became part of their circle a year or two after they moved from the house. I spent a lot of time in the apartments and houses of each of their parents, and later their own. But for over 30 years I heard stories of the house. Recently, they bought the house back and their mother moved back in and although they live far away they and their spouses spend long weekends in the house restoring it and remaking it. Even as they recreate poses from old photographs they tell stories about the house and their family. Many of the stories are old wounds, covered in protective scabs of humor. Not everything in that house was happy, not everything was good, but it was their childhood home. My parents still live in my childhood home. I do not think of myself as having had a happy childhood. I mainly think of my childhood as lonely. I know now that it was probably a fairly normal 1970s-80s, suburban childhood. A little stranger and sadder than some, less tragic than many. I was not happy, but I loved my bedroom. In 5th grade I decorated it in rainbows. Two different rainbow themed wallpapers covered opposite walls. I had twin beds with rainbow sheets, matching yellow comforters and shams, and navy blue dust ruffles. I would sit in my yellow, rainbow filled room and listen to my parents fight. I had a walk in closet painted a deeper yellow than my comforter and I could fit comfortably under the bottom shelf. When my parents’ fighting was at its worst I would sit under the shelf and read. At night, I would lie in bed under my yellow comforter and look out the window at the trees and my rusty jungle gym and write stories about the future in my head. In the stories I lived somewhere else with people who knew me and loved me. Later, I dreamed about boys and later still, I made out with boys on top of the same yellow comforter. Eventually, I lost my virginity in the same bed and for a few minutes I felt that I had made my dreams come true. If the boy I dreamed about in that bed was actually in the bed, then surely, all my other dreams would also come true. One day I would live in a different, less lonely world. The day after I graduated from high school I moved out of the house. I moved in with a friend who is now married to another friend, and together with his siblings, they own their childhood home. When after college and a failed attempt to move to LA I briefly moved back to my parents’ house, I did not live in my room, but in the larger room that had been my sister’s. I spent most of the time deeply depressed, rarely leaving the room, until suddenly, I did. I moved to an apartment a few miles away, returning to my old room only a few times, once when recovering from surgery and later when I visited from farther away. I lived in my parents’ house for 11 years. I have lived in my current house, the only home I’ve ever owned, for almost 15 years. Still, whenever I have a dream of being at home, it is in my childhood home, in my rainbow room. The last guy I dated before I met my husband told me that sometimes when he couldn’t sleep he pretended he was in his childhood home. In his mind, he walked through the house touching things until he fell asleep. His father had died young and his only memory of him was lying on his chest as a toddler on a warm, summer day. He remembered looking at a glistening glass Coke bottle on the coffee table. The memory troubled him because having been raised by a mother who routinely yelled “Take off your shoes before you walk on my clean floor or I will cut off your legs,” he found it difficult to believe that even a dying husband would be allowed a sweating bottle with no coaster. He worried the memory was false, but still he touched the bottle in his walk through the house. It was the only conversation we ever had that made me think I might love him. 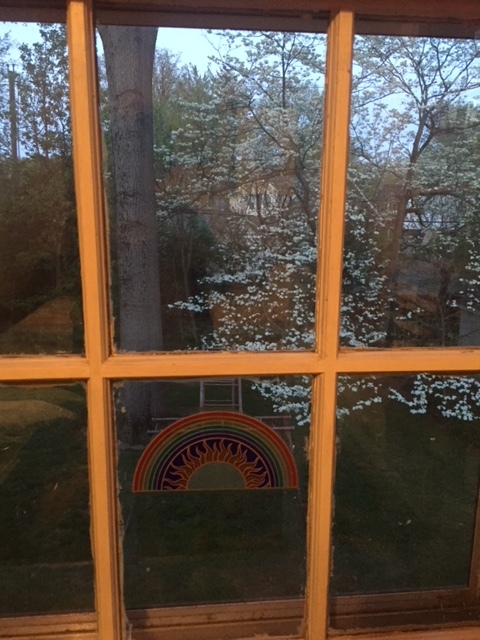 Now, when we go home my husband and I sleep in the basement, once the site of raucous teenage parties, and our children sleep in my old room, no longer covered in rainbows. My mother has claimed the room as her study, or one of her studies and turned my bed into a daybed. She has papered the walls and covered the bed in a deep, rich, tasteful red. This weekend I went home with just my daughter. We listened to soundtracks and cast albums on the drive up and talked about her impending 8th grade graduation. Not for the first time I realized that she is closer in age to my teenage self than I am. Being 14, my daughter wanted the privacy of the basement and so I got to sleep in my room. She and I visited my friends in their childhood home and I came home and went to sleep in my bed. I looked out the window and thought about how I cover my own wounds in sentiment and wondered what future stories are left for me to write. I think perhaps for my friends and me our dreams came true and yet nothing has turned out exactly the way we imagined. As we get older I think we realize that’s probably the best outcome anyone can hope for. Maybe this is why some of us are drawn to our childhood homes. It is not a longing to go back, but a longing for a time when we had more certainty about the way forward.